Here's a game for you the next time you pick up the sports section of a newspaper. (If people still do that these days. Zing! High five!) Find their local columnist and count how many consecutive one-sentence paragraphs that lead off their article. Today, it's Woody Paige, and the count comes in at six. I'm sure that's not a Denver Post record by any means, but six sentence-graphs in a row is a pretty solid day at the office. Let's sample a portion of that, shall we? Last season, the Broncos stunk like a skunk. The stench could have been worse. 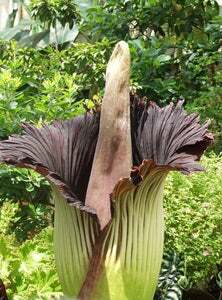 They were close to stinking like a Titan Arum, a large, flowering plant that is indigenous to Sumatra and emits an odor considered by many botanists, and the people in Sumatra, to be the foulest on Earth. Oh, Woody, Woody, Woody. You're not supposed to explain your jokes. Here's how it works. If you go for obscurity, you're supposed to just leave it out there, in which case the four greatest living botanists will laugh uproariously. Then the rest of the people will search Wikipedia for that item, then kind of get the joke. It's a formula that's worked well for me.